A while back we introduced the TinEye API: a paid search alternative for professional, commercial, or high-volume users. While the free version of TinEye only allows you to do a limited number of searches per day and is for non-commercial use only, the TinEye API allows you to purchase as many searches as you like for commercial or non-commercial use. 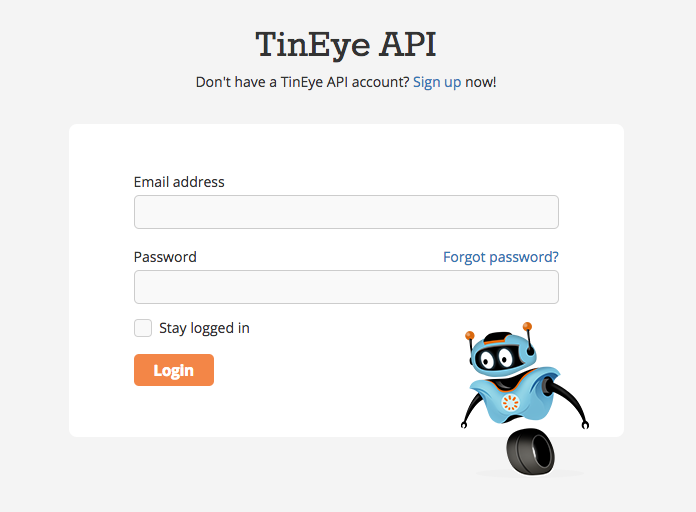 We initially launched the TinEye API as an API only. Using it required integrating the TinEye API with your web service or application. However, what you may not know is that we also provide a user-friendly interface for TinEye API accounts. This means that you can create a TinEye API account and use it to search for images in the same way that you are used to doing at TinEye.com. Upload an image, or cut and paste a URL. There is even a separate browser extension for commercial accounts so that you can right-click on any web image to search for it. So let’s get started! Here is a step-by-step tutorial on how to get you or your company set up with a TinEye commercial account and start searching… the easy way. Go to the TinEye API website. This is different than the regular TinEye website, and all of your TinEye API activities are completed there, including searching and checking your account. Scroll down to the pricing section and select the bundle you’d like to purchase to sign up. Fill in all of your details, and if you are using the TinEye API commercially, don’t forget to provide the URL for your company website. You will receive an email verification as soon as you’re done. Check your email for a message from TinEye and click the verification link! You will be asked to log in with the email and password that you just used to sign up. Once you’re logged in, you’ll find yourself on the Welcome page. Don’t click away yet! There’s some good-to-know stuff here to help get you started. You can get back to this page from wherever you are on the site by simply clicking “Welcome” at the top of the page (but you need to be logged in!). Before you can start searching, you need to buy a search bundle (you need to be logged in to actually buy a search bundle, but you can see the pricing even if you’re not). Transactions are handled via PayPal or credit card; as soon as you’re done you’ll be directed back to your account summary page on our site, which will show what you just purchased. You’re all set! Click on the Search tab to get started. Then simply search the way you would normally do on tineye.com. Upload an image from your local drive to search for it, or point to a web image or web page by pasting the URL. To make searching even easier, get the browser extension for TinEye API accounts. It lets you right-click on any web image to search for it (currently available for the Firefox and Chrome browsers only). To install, go to the Search page and select the API extension for your browser. Remember you can only see this page when you are logged into your TinEye Commercial API account! Note: The browser extensions for the regular version of TinEye found at our TinEye.com extensions page will not work with your TinEye API account. You must install the TinEye API version to perform searches that will work with your prepaid search bundle. And that’s it! Happy searching! If you have a TinEye user account we recommend that you reset your password today. This is due to the Cloudflare security issue. How do I change my TinEye.com password? Change your password on this page. If you can’t remember your current password, you can request a password reset. Hello TinEye fans! If you have dropped by TinEye recently, you will have noticed our new TinEye design. We’ve been busy, quietly releasing a number of updates both for you and our corporate image recognition clients. Today, we would like to tell you about what we have done to make TinEye more useful to you, our fans. Did someone say 10 billion? Yes, we did! TinEye fans, we hope that you wrap up your week with as much excitement as we have here in the TinEye HQ! We’ve reached 10 billion images and are gearing up for the next 10 billion. And thanks for joining us in this awesome adventure. Happy searching and have an awesome weekend!